204A Oceanfront & Lagoon Pool, 2 Bedrooms+2 Bunk Beds+Crib+Beachset for 2! KEYLESS ENTRY! 2 Bedrooms + Bunk Room–2 full size twins can sleep 6 in beds. Published rates are competitive & include: sat to sat rental, private beach w/prepaid Beach Setup for 2, reserved parking space, secured WiFi, and use of property amenities. Vrbo requires all pmts go through them, with their new service fees that owners have no control over. You can choose "eCheck" at checkout that is still a free service for all. FIRST PHOTOS VIEWS FROM OUR HUGE COVERED LANAI–check out the view! Quote will include 11% FL state tax, cleaning, and HA/VRBO service fee. You may add an additional beach setup for $200+tax/week. This is a special added service we offer at cost for our guests so you can focus on fun & relaxation! Let us know if you have any special needs. Summer Season rental weeks are Saturday to Saturday. Spring, fall & winter months offers shorter stays. Let me know if you need dates outside listing. LEAVE NO TRACE PLEDGE: We ask you to join us and protect our beach & ocean life. This requires you to pitch in and pick up trash daily (there's a lot plastic, straws, straw sleeves left from juice boxes), and fill in ALL the HOLES daily vs leaving open turtle graves. This protects our nesting turtles from falling in and becoming death trap as morning sun bakes them alive. Our marine life struggles to live once they eat plastic & trash that looks like food. This teaches all generations to be responsible protectors of this fragile ecosystem that we cherish. Thank you! Best Seagrove Beach Condo...Our beach home is located at DUNES of SEAGROVE, Unit 204A, 2nd floor in the east wing over the waterfall lagoon pool side, with the amazing ocean as your backdrop, an elevator, enclosed breezeways and stairs at end of the hall. This is the fastest way to our parking space––see parking map. 1st space on right outside garage. Our paradise is perfect to create family memories in a very safe community. JoBoKen Dunes is located on a dead-end street, on the Gulf of Mexico in the quaint village of Seagrove Beach. We face the Emerald Coast, and located in the middle of Deer Lake Wildlife Reserve (natural undeveloped state park) & Eastern Lake, perfect for Yolo paddle boarding for the whole family. Just minutes from 30A dining, shopping, art galleries, & bike rentals. New HUB is just next door, and Seaside is about 2 miles to the west. 30A is tucked between west PC Beach and Sandestin, FL. JoBoKen Dunes is a 1-level home, perfect for young & elders. Elevator gives you easy access to our 7500 sf double-lagoon waterfall pool & hot tub. We have one of the easiest access to private beach, with a short boardwalk and a few steps to sand. JOBOKEN has a strict NO SMOKING POLICY with $1500 minimum fine for smoke removal. Best Seagrove Condo, JoBoKen Dunes has one of the most spacious covered lanai that overlooks waterfall pool. Master suite has king bed with private bath, jacuzzi tub, separate shower, & double sink vanity, with a nice ensuite & private entry to lanai. The second bedroom has private entry into hall bathroom. Also, this unit has an adorable bunk room off foyer that our kids & adults alike love, along with use of our pack-n-play for your little one (used at own risk). Just bring your bedding, and have one less item to pack! Situated on the gulf side of 30-A, Dunes of Seagrove is next to Deer Lake State Park, a magical experience for all ages. Walk east down the beach and you are standing in some of the most beautiful untouched dunes in the area ~ truly an amazing coastal habitat. The dunes are protected ~ Please do not climb on these protective barriers. From Deer Lake, freshwater streams flow into the gulf, a breeding ground for crab, lobster, fish, frogs and turtle nests will be flagged. This alone is reason to keep us coming back year after year. After 20 years, this is still our favorite beach! Come and experience it for yourself. Download our 30A app to have everything at your fingertips. NEW BEACH SET-UP POLICY: All Beach setups are first come first serve daily! Beach set for 2 is included with your weekly rental, and you will be on reserve list upon arrival for stress-free vacation. You may rent 2nd set for additional fee, $200. This is our hard cost by 3rd party beach service that we pass through & manage for you. But you can remove altogether. All personal chairs must abide by strict rules with inline setup on either side of front row. NO chairs can be setup in front of DOS rows. This blocks everyone's view, and we want everyone to have a great day at the beach! Setup is first come, first serve daily. Beach Hut opens @8AM daily. HEATED POOL: Discretionary during Spring Break & Thanksgiving, based on number of guest during holidays. Spring Target Dates may fall between: March 15 - April 9, depending on the busiest spring break weeks. *SMOKING POLICY: IF YOU SMOKE IN THIS UNIT, YOU AUTOMATICALLY AGREE TO PAY THE $1500 DEEP CLEAN FEE TO REMOVE ALL RESIDUE AND PROFESSIONALLY CLEAN ALL NEW FABRICS & SURFACES, or REPLACEMENT COST. **Minimum Age: Must be 28 years old to rent this unit. JoBoKen Dunes is named for 3 sisters, JoRita, Bo & Kendra. With all our travel combined, this is our favorite beach to build sand castles with the kids, explore Deer Lake next door, play in the emerald green ocean & watch amazing sunsets! You won't find a better place or value to vacation. Great for long weekend getaways, available outside season. Memorial Day to Labor Day are weekly rentals, Saturday to Saturday. JoBoKen Dunes is located in Dunes of Seagrove's private, most beautiful beach on 30A. Unit 204A, looks out over the emerald gulf and our 7500 sf waterfall pool, newly resurfaced with LED lighting. With one of the largest pools and outdoor space, makes this beach front property one of the best vacation destinations on Hwy 30A. Biking, skating, walking is the best way to get around on the Greenway that runs from Rosemary Beach to Blue Mountain Beach. Location, Location, Location ...JoBoKen Dunes is located between Eastern Lake & Deer Lake Wildlife State Park. We are a hidden gem, nestled on the ocean with a private beach all to ourselves! Located on dead end street, with no through traffic, makes our location a safer place for kids and biking. Very quite & quaint, as you walk along the sugar sand dunes. Enjoy the magic & natural beauty from Dunes of Seagrove to Water Sound! Nestled between Eastern Lake (great for paddle boarding) & Deer Lake Reserve for exploring new crustacean hatchlings in the brackish water streams heading into the ocean. We are located on 2nd floor, in the middle of the east wing, overlooking the lagoon pool with the ocean, beach, sand & surf backdrop. NetCom online streamling service with access to all streaming apps! Pls turn off AC when doors/windows are open, or it will freeze up fast with high beach humidity. Towels & fresh linens are provided each week. Please help Seagrove stay environmentally friendly & hang your towels up daily to dry. You may hang bathing suits outside on the rack to save more. TX! Small mini stack unit in bunk room closet, not meant for large loads. Drying rack is provided on lanai for suits. Do not hang over rails. Thank you! PLS CLEAN LINT AFTER EACH USE. Small mini stack in bunk closet, for quick dry, not meant for linens or large loads. Drying rack is provided on lanai for suits & beach towels. No hanging on railing. Private parking space just outside building A--clearly marked 204A. Add'l parking around the office in unmarked spaces only. Each visitor requires a parking pass on dash at all times, or risks towing. Unloading / Loading only - Carts & Luggage Racks are provided on right of elevator, under stairs. Unload, move car outside on the right in 204A space. Use the side stairs to meet your family in unit. FREE Secure WiFi for JoBoKen Dunes Guests! Bath linens provided, you only need your beach towels. Please consider the environment and hang towels after each use. They dry fast at the beach! Fitness Room / Sauna are free for our guests–Key kept in basket drawer. Beautiful Tennis Courts have code lock, and will be included in pkt. FREE WiFi & secured for JoBoKen Dunes Guests! Property also has stairs at each end of the walkway to give you easy access to/from 2nd floor. Brand new with good ice production. **Caution: Pls don't hold doors open while loading/unloading, or it will freeze up fast in this high humidity. DEC18 New Glass Top Stove! Coffee Maker with Copper sustainable filter & thermos carafe and French Press. Extra touches included: French Press, Crock Pot, Thermos Coffee maker and Hi-End Glass Blender. Be sure and bring spill proof cups for your children/toddlers. We can't seem to keep them. Coffee Maker with reusable filter/carafe, crock pot, french press, wide Bagel toaster, and Heavy-Duty blender for frozen drinks! Bar has barstools for extra indoor seating. Lanai has Winston patio table for 6 for a wonderful outdoor dining. Bar has 3 stools. Book Share: Take one, leave one. Outside Fitness Room on side of RQ office. Our property is on a dead-end street, so we have plenty of green space around pool area, crossing over Chivas LN. Available for rent onsite through us, or Butterfly & 30A rental--most deliver with pre-orders. Various paddle board rentals at beach hut. Paddle board rentals on the beach. Check with our guys at the hut! 2 tennis courts - keyless entry code in your info pkt. Several Golf courses along 30A. Great 1 level property that meets ADA requirements with level ramps to pool and boardwalk, with a few steps to get down to the sugar sand beach. Large wheel beach chairs are available for rental. During our winter months: Nov - 1st week of Mar, 30A is alive with active seniors, or snowbirds! 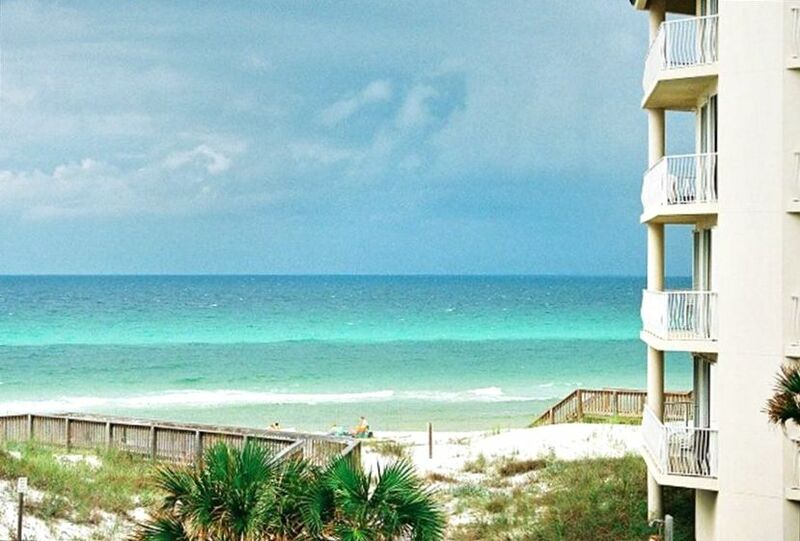 Our returning guests are celebrating 14+ years in the magic of Seagrove Beach. Located in fitness center on side of office. Door is kept locked, and Key is kept in top Basket in kitchen chest. Private Pool for Dunes of Seagrove guests only. 7500 sf lagoon pool with waterfall, one of the largest on off 30A! Heated during spring break & thanksgiving week only. Private beach as well. Private for Dunes of Seagrove guests only. JBK DUNES Maintenance is provided by DOS onsite. Office Building also houses our well equipped fitness club, showers/sauna, and 2 tennis courts just beyond the office. Office has party room and meeting room available for special events & meetings. Great location, and Condo was beautiful. Very comfortable. Fully stocked Kitchen, great extras, and bed was extremely comfortable. You have the most gorgeous view of the beach and overlook the Pool and fountain....the whole family enjoyed it, and my husband caught a GREAT big red fish right off the beach....if your looking for a great vacation JoBoKen is IT!!! So happy to hear how much everyone loved their stay at JoBoKen Dunes! Thank you for your great feedback, especially about our view–it is gorgeous! Congrats to FisherVan for the largest Red Fish I've seen yet. We look forward to having you as our guest anytime. We have spent the last nine years at the JoBoKen Dunes condo at Dunes of Seagrove during the winter months. The owners have been wonderful and always makes sure everything is in order when we arrive. We love the gorgeous view of the white sand and sparkling blue and teal water. We enjoy the residential areas close by for walking and numerous shops and restaurants on 30A. We can’t say enough about this quiet off the beaten path condo that offers beauty and refreshing experiences. Thank you Janice & Ray. We’ve enjoyed having you too, and feel like you're part of the JoBoKen family! We look forward to year 10 in 2020! We love the JoBoKen condo in Seagrove Beach, FL! We just ended our 9th consecutive year at this condo. It is a great place to stay.....off the beaten path with a gorgeous quiet beach with white sugar sand, but also close enough for dining out and shopping. It is beautifully decorated and has a relaxing lanai adjacent to the pool waterfall, with a view of the gorgeous teal water. It is a great place to stay for either couples or families with children. The owners are wonderful and will always make sure everything is ready for you upon your arrival. Thank you, my KY friends. You're like family now! Cozy and comfortable condo! Well-maintained and great location! Wonderful stay at JoBoken Dunes! Very clean and comfortable! We appreciated all the extras including the beach cooler. The bedrooms were comfortable and well designed. The kitchen was well-stocked and the view of the pool and ocean was fabulous! Our only complaint was having to stand in line for beach chairs every morning at 7:30 am to get our extended family's beach chairs together. Hope that Dunes of Seagrove reconsiders this policy, as it takes away from the relaxing morning at the beach. Thank you for sharing your experience aboutJoBoKen Dunes & the level of cleanliness during your stay. Owners despise this newer “get in line” Mentality, implemented by Wyndam/ResortQuest. Unfortunately, our private beach is still owned by the developer, and leased to Wyndam/ResortQuest to manage beach setup. I wish owners had a say, or could actually vote on this, but our hands are tied. I do suggest writing Wyndam/RQ a review on the way they choose to manage DOS beach setup. MAYBE IF THEY GET ENOUGH PUBLIC COMPLAINTS, they’ll change back to the way it’s always operated. This is our only recourse. Thank you! My family has been going to Dunes of Seagrove for the last 5 years and our stay at JoBoKen Dunes topped all the condos we had previously stayed in. The room was very well furnished and super clean. We loved that is was centrally located in between both pools, with a wonderful view of the beach. Dealing with the owners was wonderful. If you had a question, just send a message and you had a answer within 5 minutes. Very customer service friendly. We will definitely stay at JoBoKen Dunes again. Thank you for a wonderful vacation!!! And we loved having you as our special guest, Jimmy! Thank you for sharing your experience with JoBoKen Dunes, and for mentioning our excellent southern hospitality! We look forward to having you back soon & have a great summer! Great property,location,and beach view! The beach set up was nice! Thank you Kim for the review! We loved having you, and you’re welcomed back anytime! Beach set for 2, secured WiFi, property amenities, reserved parking space just outside A garage, & cleaning fee is included in Posted Rate. Download 30A APP to have everything at your fingertips. Biking is the best mode to explore 30A via our greenway, which runs for 25 miles from Seaside & Blue Mt. to the west, to Alys & Rosemary Beach to the east. Bike/golf cart rentals, movie rentals, restaurants, shopping, and physicians offices are all located on 30A.